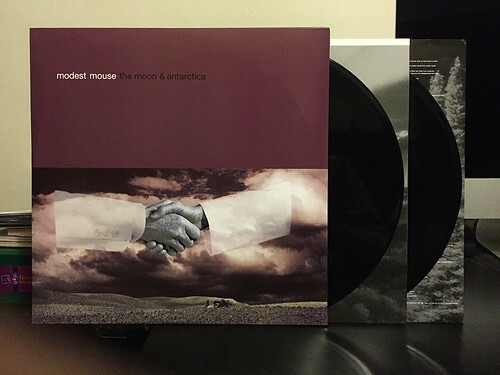 The main reason we're even having a Modest Mouse Monday on this website is because of The Moon & Antarctica. While not the first Modest Mouse songs I had heard, this is definitely the point in time where everything clicked and I became a fan. I actually had the original pressing of this from when it first came out. But around 2008-ish, it was selling for about $100 and at the time I needed that $100 more than I needed the record. Besides, there's just no way it wouldn't have been rereleased at some point, right? By now it's actually been rereleased a few times. This is the 2010 Tenth Anniversary Edition. I got it for an absolute steal during some website sale that Best Buy was having. I want to say it was under $10, but I can't be positive of that. Regardless, I'm happy to have it back in the collection. While I think the highs may be higher on some Modest Mouse records, I also think the lows are lower on the rest. The Moon & Antarctica is the band's most consistent effort in my opinion and my feelings for this record are probably also enhanced by the fact that this is the record that started me listening to them. I always find that a band's first record that winds up in my collection tends to have more of an impact on me than any others. Not much to say about this specific reissue. The double LP on 180 gram vinyl is as you would expect. Artwork looks nice. I'm not sure if there's a definitive version of this album to own, but this one certainly works out just fine for me.